Thank you for a wonderful stay and amazing kindness. Very friendly and welcoming but not intrusive. The real Boss was a hoot!!!! Lovely quite location. 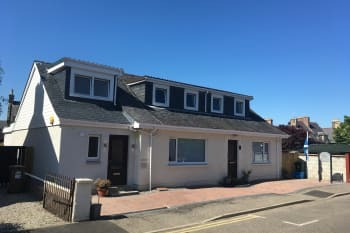 Easy walking distance to centre of Inverness for all amenities. A very nice place to stay. Very friendly owner, makes you feel at home. Only 5 minutes walk from the centre. We had a wonderful stay. The breakfast was amazing. Would definitely come back to stay again. Close to town. Easy walking distance to shops and restaurants. Very friendly helpful people serving great breakfast will definitely stay again !! Very quiet area but close to town centre & amenities ! Kenny was the best host / Innkeeper in all of Scotland. I’m sure he can’t wait till Nov 1! Great city. Great inn and great location to walk to town and dinner locations. We will definitely be back. And that is from America. He was our favorite host. Definitely a good place to reserve. Excellent host very friendly and welcoming. Being served a great breakfast by the host wearing a kilt was a nice touch. Sam's Indian restaurant was excellent and would recommend. North American tourists will be surprised that stores and cafe/restaurants close in the early evening. It would be good to know that they need to eat early. I thoroughly enjoyed my stay at Silverstrands. Kenny is a most gracious host, and having breakfast served by a kilted Scot was a wonderful experience. It was easy to walk wherever I wanted. My room had a lovely garden view. We were in Inverness during the annual marathon, so restaurants very busy. Host helps with suggestions and reservations. Would definitely stay at the Silverstrands again. The owner Kenny was absolutely amazing! His place is beautiful and he was very helpful, knowledgeable and kind. Free street parking was really nice. Kenny was very welcoming and happy to advise in things to do etc. Staff is extremely friendly and helpful! The breakfast is wonderful. The room is comfortable, well laid out and very well maintained. I will stay here again when returning to Inverness. Easy walk to downtown and shopping. Short cab ride from the train station. Restaurants within two blocks. Great location. Exceptionally clean. Kenny's wife cooks a wonderful breakfast. Locatio within walking distance to centre. Kenny was great. His wife is a marvelous cook. Room clean an comfy. Excellent B&B and would highly recommend to anyone visiting the Inverness area. Fantastic hospitality and awesome breakfast. And Kenny in a kilt was a lovely touch!! Great hotel/pub just 2 minutes walk so very handy. Food and beer excellent. Kenny was very friendly, helpful, and accommodating. If you are looking for a 24/7 front desk or late check in, this may not be the place for you. If you have any questions or concerns before booking, I would suggest emailing them through the website. Kenny is very responsive. We would definitely stay here again and recommend Silverstrands to our friends. Had a wonderful stay! Communication was great. Breakfast was delicious! Exceptional accommodation, hospitality and owners Kenny and Dorothy. Pristine establishment with immaculate facilities, in a great location, and providing the most delicious breakfasts. Will definitely book again when next in Inverness. 7 mins walk into city and main bus station. A couple of nice restaurants and small shops nearby. Lovely area. Short walks to Loch Ness, the Castle, and many other attractions, and plenty of restaurants to choose from and tour meeting points nearby. The only complaint I have about our stay at Silverstrands is: it was too short. (That is our fault, though!) 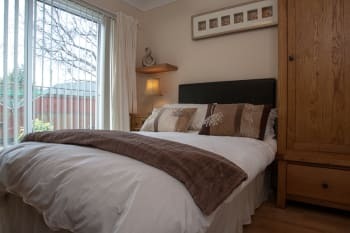 It is a great B & B, comfortable and friendly on a quiet street but an easy walk into downtown Inverness. Coming back is uphill, but a good way to work off the local food and drink, including the delicious Silverstrands Scottish breakfast! Thank you! We very much enjoyed meals at the Castle Tavern (per Kenny's recommendation) and Number 27 pub. Black Isle Bar on Church Street is a pleasant place that serves delicious craft beer, wood-fired pizzas and the best oat cakes I have ever tasted! Our server told us they are made right there. Had a delightful day meandering through the Ness Islands to the botanical gardens. Although the entrance to the Inverness Museum and Art Gallery is a bit hard to find it's worth entering. The museum is free, but I was inspired to leave a donation. Silverstrands was very clean with nice facilities. Kenny was a considerate host who made us feel welcome and at ease. We appreciated his advice when we ventured into town, and the breakfast he served was delicious. The location of Silverstrands is just a quick walk from the main commerce area of Inverness, so very convenient. Kenny was super welcoming. We couldn't stay for the breakfast, but the selection was amazing. Location is good and very quiet. Very friendly, helpful and attentive owner, spacious room and bathroom, both(!) with heating, not far away from railway and bus station, also gluten-free options, fruits and many little cheese sorts (otherwise so much plastic waste), many shelf spaces, very good WiFi. For physical disabled guests I cannot recommend a room upstairs (narrow stairs). Restaurant/bistro Girvans next to Eastgate Shopping Centre (also gluten-free delicious cakes, friendly staff). Lovely breakfast, easy walking distance into Inverness and a local pub that does food all day. The owner is really kind. The hotel is very clean and they take care of every detail. Breakfast very good and various. Near the center, with the possibility to park in front of the Hotel. Our stay was great! The Host was wonderful. The food was good and place was very quite. The nearest resteraunts are only a 2 minute walk. Nearest store is 3 minutes and town is only 10 minutes. The area is really clean and safe. Awesome welcome by our guest! He responded greatly to all our questions. Absolutely top notch. The rooms are quiet and immaculate, but a very easy walk into town. Kenny and his staff go above and beyond to make sure that your stay is a happy one--and breakfast is good, too. Everything was great! We were not there for much more than sleeping and breakfast, but our stay was very pleasant and breakfast was great! Parking was a bit of a pain but helped by the staff. Just wonderful. Beautiful place, Fantastic host. Probably the best breakfast we had in two weeks of travel through England & Scotland. Close to downtown, easy walk. The person responsible (I don't remember his name, something like Kane) was great. The closest pub. Good food and good beer. Silverstrands is a very good guest house situated fairly close to the Eastgate shopping Mall. It is, however, at the top of a steep hill which can be awkward if you are on foot. The proprietors are very friendly and helpful and are more than willing to answer any questions about the city. 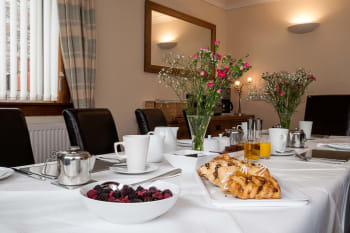 The room we were in was very comfortable and clean and the breakfast was excellent. The only thing lacking was a guest sitting room. If you have been on any open top bus sightseeing tours, Inverness is maybe one to avoid. Great place to stay and is in walking distance to bus and train station. Very clean and had comfortable bed. WOW Scotland tour to SKye was a lot of fun! Really nice and welcoming. Fresh room and comfortable bed. A bit warm but then weather was insanely hot...especially for scotland. Good bathroom though a little awkvard since not on suite and on route to breakfast room- this we knew though! -and it was very nice. Perhaps a shelf to put your necessessities on in there would be helpful. Great breakfast! Loved the location. It was close enough to town to easily walk, but in a quiet section which was nice in the evening. We had the small room but found it very comfortable and with everything we needed for a nice stay. The staff was so kind and friendly. Especially enjoyed the walk alongside the river with plenty of places to rest and enjoy, or stop for a drink or meal. Perfect way to explore Inverness. It was the perfect place for us during our visit to Scotland. Staff was super friendly and helpul. The room was nice and clean, bed was comfy. The location was perfect, not in direct central but close anyway. Our main activity this weekend was to go on a whisky tour and just relax. Except from the tour, which was great, we visited Loch Ness and Urquhart Castle. It was really beautiful. We took a taxi from Inverness to the castle, but we went by bus back. No problem. Friendly and welcoming with clean and comfortable room. Enjoyed breakfast a lot. lovely place and very great host. A lovely and friendly place. Nice breakfast. The malt room, a very nice whiskeybar. A beautiful,comfortable room with a great host. Delicious, plentiful breakfast. Highly recommended. Sicuramente positivo, una buona struttura in posizione comoda per raggiungere il centro a piedi, pulita e ben tenuta, il gestore è molto disponibile e gentile. Funzionale. Inviting innkeeper/owner. Wanted to make sure we had all we needed. Would have liked 2 chairs in room. Thanks Kenny for the great hospitality! 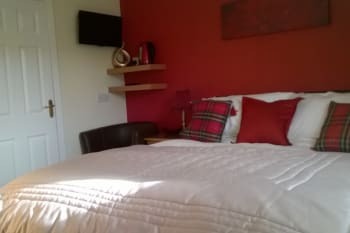 Guesthouse is clean, quiet and in a great location to explore central Inverness. We had an amazing dinner at the Turkish Mediterranean restaurant in town and would highly recommend it. Thank you very much! It was a great trip, the rooms were clean, staff (Kenny) was very friendly, and the ambiance was lovely. Breakfast was exceptional. Kenny, the owner, is so friendly and helpful. Silverstrands was a wonderful base of operations to enjoy Inverness and the surrounding area. The Fig & Thistle Restaurant was wonderful, as was the Corriegarth pub, which is located at a nearby hotel. We drove to Fort George and did a self-guided tour, which was excellent. Dallas Dhu Historic Distillery is a little further away but is also worth the trek for a hands-on experience at a defunct but restored distillery. We had a wonderful time at Silverstrands! The room and breakfast were fantastic. The location was perfect--a short walk to the city center, but also on a quiet side street. Thanks for the wonderful visit. The owner was very helpful and informative of how and where to get to / eat in Inverness. Only 10mins walk. Quiet location with parking. Very comprehensive breakfast. Perfect. Great time staying with you. Easy to navigate all the sites walking. When we booked we were advised that the room was small and there was a queen bed. Expecting something like a cupboard we were more than pleased to have a beautiful room. 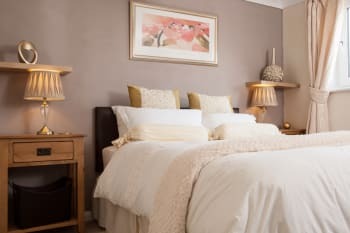 Okay it wasn't huge but we felt it was certainly adequate with a double bed, two bedside tables, a tallboy and large wardrobe and ensuite shower room. Excellent service and more than plenty selection for breakfast. Would certainly use again. We enjoyed our stay at Silverstrands. Kenny and his wife are very gracious and kind. Thank you for helping making our first visit to Inverness a great one. We will be back! Silverstrands is a great location. Less than a 10 minute walk from the Inverness train station. Close to everything, but set in a residential neighborhood, making our time their very peaceful. We were delighted with our overnight stay at Silverstrands. The room was very comfortable and Kenny, the host, very welcoming. Breakfast was excellent woth plenty of options. On street parking is available by arrangement with Kenny. The town centre is less than 10 minutes walk away. We had an excellent dinner at the Fig & Thistle restaurant. Not cheap but the quality of the food is very good. Need to make a reservation as they were turning people away the night we were there. Great stay on all fronts. Impeccable accommodations and wonderful host. The most fantastic beds we have ever tried away from home!And a lovely breakfast served by the kilt-dressed owner. Silverstrand way easy to find, and in walking distance from city center. We would rate the hospitality a 10+. Great place, fun and good breakfast! Ideally located to the train station and shopping area. Our train left before scheduled breakfast, so Kenny prepared a takeaway package which was enough for breakfast and lunch. Excellent service. Schnell zu Fuß in der City, alles perfekt erreichbar. Very friendly host Kenny. Great cooked breakfast if you want. Wifi excellent. Shower small so if you are large person ie 100kg you might be squished. Hootananny great restaurant. Has music after 9.30 as do most places. New city laundrette about 1km away. £5 wash. £1 per 7 minutes drier. You'll need 28 mins on medium. Thank you for your hospitality and great advice we loved the live music and breakfast was delicious! Wonderful made-to-order breakfast, and a friendly host. Thanks for your hospitality! Lovely to see a man in a kilt in the morning. Ideal location and easy walking distance to town. Plenty of parking. Ask Kenny's advice on where to go, out and about, always willing to help. Good selection at breakfast to set you up for the day. Heathmount Hotel, 5 minute walk, has a good selections of Gins and good food. Short walk into town in the evening for a varied selection of restaurant's. short walk to center of town and bus/train station. Lots of restaurants in the area. Very well situated - you can walk into town in 5 minutes. Our room was very clean and comfortable and our host, Kenny was charming and very well informed. Kenny and his wife where very friendly and went out of the way to make us feel very welcome. We will stay here again when we visit Inverness. The White house bistro in the centre is a great place to eat my wife is gluten intolerant and they catered for her diet. DO NOT go to ASH restaurant they have no Idea regarding gluten free my wife asked for gluten free soup and bread, they brought her a normal roll. We received a warm welcome Location was perfect walking distance of town centre. Good parking Very clean and comfortable stay. Breakfast was superb choices to suit all tastes. Great place to stay with easy access to the town. Plenty places to eat locally . I would book an evening meal in the town as very busy in lots of places. Highly recommend a boat trip to see dolphins free bus service with the dolphin spirit to and from the marina . We enjoyed our stay at Silverstrands. Wonderful breakfast and walkable from the train station. I unfortunately forgot the gentleman’s name who was running the B & B, but he was extremely friendly, helpful, and welcoming. We were there for 2 nights and it was our favorite stay in the 12 days we were on vacation. Plus, it was a great location. About 10 min walk from downtown! We will definitely stay there again the next time we’re in Inverness!!! STAY HERE!!!! Great staff and location!!!! 10 mins walk to city centre but great local pubs and restaurants within minutes to this property. Everything was perfect! Very beatiful and clean accomodation, friendly staff, fantastic location in a quiet place and near the town centre, great breakfasts. Such a friendly atmosphere with a lovely warm and inviting feel to the place. Very clean and modern room with a good sized bed. A perfect sized room for a short stay. Breakfast each morning was perfectly cooked and presented with a selection of cereals etc if you preferred. All in all a lovely B&B, and one which I would highly recommend to others and will certainly be re visiting. Very close to the town centre so all amenities etc are close by. Lots to see and do locally. Perfect. Had a lovely 2 night stay at silverstrands. Kenny was very welcoming and the facilities were excellent. Would highly recommend. Kenny is a great host. Top of the line. The brown bread they serve for breakfast was the best we had during our stay. Top notch breakfast. Rooms were clean and accommodating. Quiet location, but with an easy walk to the city center. Plus Kenny's hilariously large parking pass was something you won't soon forget. Great location. Ten minute walk to downtown Inverness. Very welcoming and comfortable with a excellent host and wonderful breakfast. Would definitely stay there again. Castle Tavern for dinner and good views of the city from the Castle. This was our first visit to Scotland. We had a fantastic time. Staying at Silverstrands was a perfect addition to the trip. You could not ask for a better location. We were able to park the car and explore the town on foot. Visiting Loch Ness and Culloden were just a short drive. Would love to stay again if we ever get back that way. 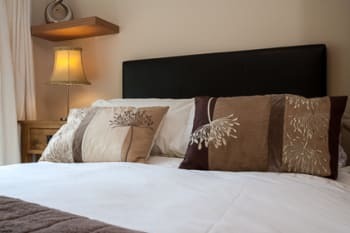 This is a cozy and quiet place to sleep, and only a few minutes' walk from two hotels with lovely restaurant for supper, and just a few more minutes' walk in to the city centre. Kenny is an enthusiastic and friendly host. Highly recommended! We had a very enjoyable 4 night stay. The facility is on a quiet street which is about a 15 minute walk to downtown Inverness. Our room had its own bathroom, while some of the other rooms share a bathroom. The room was very nice with a comfortable bed. You have a good selection of breakfast options served by Kenny in his kilt outfit. 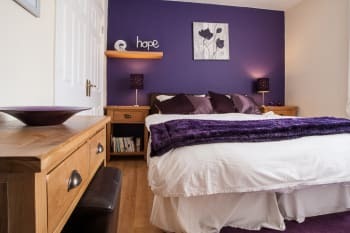 We would highly recommend this B&B for your stay in Inverness. Everything was even better than expected, the room was big and comfortable and we had a great stay at Silverstrands. I would recommend to stay at it as it's not far from the centre. Extremely Professional and Nice staff. House was clean and comffy, rooms quite small but Nice and well decorated. Breakfast was good and cooked on the spot. There was also a good selection of non cooked options available. We also liked the location. Walk distance from the central of Inverness, but still far enought to Be quiet. You get directions, hints and info about surroundings from the staff. Excellent place to stay if you're visiting Inverness. It is lovely to be met by the very friendly and charming host, Kenny. We appreciated his advice and enjoyed our stay. The Corriegarth pub, just a few hundred metres away, is a good place to stop and have a beer. Whatever you do when going to Inverness, do not miss visiting Culloden battlefields. Fantastic information centre; chilling experience walking out on to the battlefield. Kenny is a very friendly host. The room was clean and well-appointed. Breakfast is served, and a variety of fresh fruit and juice is provided as well. We were very pleased with Silverstrands! It was well-situated and allowed us to easily walk to the main stretches of Inverness, and you can't beat a Scottish breakfast served by a real kilt-wearing Scot! We enjoyed our stay very much. Great location and friendly hosts. Room had everything we needed, but felt a little small. Beds were made for cold winter, but were too warm for the summer nights we've spent. Also our room had no window, the slide door we didn't want to keep open during the night (as we were not sure if it be safe). Thanks again for the great time. We had a wonderful stay at the Silverstrands Guest House. The location was perfect and the room was very clean. Staff was excellent and breakfast was fantastic! My daughter and I loved this charming home! It was perfect for our too brief stay in Inverness. The owners are thoughtful and attentive, and seemed to anticipate our every need. And the breakfast is simply amazing. We will be back! We booked the WOW Scotland 12-hour Isle of Skye tour and it was fabulous! I suggest staying a minimum of 3 days as we didn't have enough time to explore this charming town. Wonderfull!!! Everything was wonderfull! The host was wonderfull, the rooms were wonderfull, the breakfast was wonderfull. I absolutely recommend it. Very comfortable place to stay, host is super knowledgeable and helpful. The Guest House is within a 10-15 minute walk to downtown and it's a grand place to visit. I recommend Hootananny's for dinner. We ate at several pubs along the way, and my list is packed right now. Make sure to carry an umbrella with you and a jacket! Unfortunately we missed a opportunity to sit in a lounge or a bar in the evening hours. Our daughter was to young to go with us to a pub, and that makes is difficult to fill the evening. But we stayed only two nights, so it wasn't such a great problem. Familys keep in mind that children under 18 are not permitted to enter pubs. The geust house has no lounge or bar or a room where you can spent the evening. Fuimos un grupito de 10 personas (tres familias). Quedamos encantados con la amabilidad del propietario, la decoración y la limpieza de las habitaciones, los magníficos desayunos, la facilidad de aparcamiento..... todo en general. Zona muy tranquila a un paseito del centro. Would be nice to have a wider selection of vegan breakfast. It would have been nice if the b & b had some vegan yoghurt. Now it was not possible to have any musli or cereals. We were there for just one night, so the smaller room was no problem. The owner was very kind and helpful. Thanks a lot! Exceptional balance of hospitality and and helpfulness and privacy. Take more time to do things in the nature and visiting by car nice places near Inverness ..because the town is very small. Great location, friendly, organised, excellent breakfast with lots of variety, clean and well kept room. It was the best guest house we've stayed in during our 17 day Scotland trip! It is a fantastic place! Parking requires a permit which the owners have ready for you to put in your vehicle. Great restaurants, pubs, shopping & train station just a 10-15 min walk. Només a 10 minuts caminant del centre i aparcament com local al carrer de residència. Friendly & helpful - great breakfast! Nice location, a little small but clean and with all the comforts that you need. Kenny is a perfect host. Reccomended. Cafè One is a good restaurant for dinner but you need to book a table. 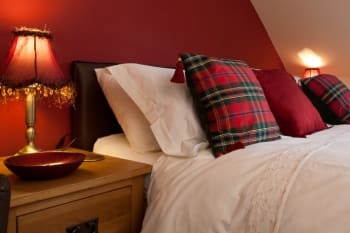 Excellent B&B in heart of Inverness! Kenny is excellent host and great cool too! Very good service, room, location and breakfast. If we return to Inverness then we will stay with you at Silverstrands. Excelente situación, a 10 minutos del centro. Habitación pequeña pero correcta. Muy buena atención por parte de Keny. We thoroughly enjoyed our stay. The proprietor was friendly and helpful. 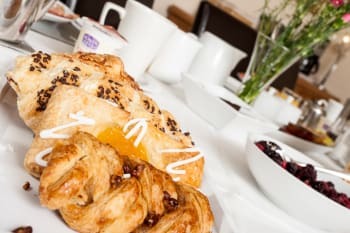 The breakfast was great and the room was comfortable, clean and well-equipped. Perfect place to stay, 10 minutes walk to the centre of Inverness; nice and caring host; good service! Good location walking distance to downtown. Friendly staff, clean premises. Our room was a bit small, but good value for the price. Breakfast room was a bit too warm to us, but the service and food were good. Parking is right in front of the guest house and easy. The Heathmount bar/restaurant is right around the corner and a great local spot for food and drinks. Ness Islands are a 20 minute walk from the guest house and worth the time. Definitely enjoy some time down by the river! An easy walk to the city. Easy street parking. Staff is fun and helptul. Perfect location, very quite. Great welcome by the staff. The room was confortable and clean. Very consistent breakfast in the morning! The service was great and the staff was pleasant. Enjoyed the breakfast and the innkeeper was friendly. Excellent accommodation and Kenny is an outstanding host. Walks around the city and just outside are interesting and beautiful. Great place to stay. Room was very clean, comfortable & bright. Staff were very attentive & friendly. Breakfast was great with lots of options. I stayed 3 nights & was sad to leave. Would stay there again in a heartbeat & recommend it to anyone. Grey location as well within walking distance to downtown. Great restaurants nearby. Loved my stay here. Culloden Battlefield is a must see but leave yourself lots of time. Clava Cairns The Heatmount Restaurant & Bar - great seafood pasta & dessert. The hosts were terrific -- giving freely of their time and great advice. I like the castle tower. It gave great views of the entire city. I also thought the Pound Store was fun, and that was just a few minutes from the hotel. Warm welcoming from a lovely host. Out room was very small but was clean and tidy. Nice breakfast. If we'll go back to Inverness I'd love to stay at Simverstrands again! Great staff and amazing food. Lots of good tips for local food and entertainment. Ample parking. Very clean and comfortable rooms. Just ask Kenny. He will point you in the right direction for anything you need! Love the town of Inverness overall. Everything was wonderful. Breakfast was such a treat in the morning with tons of options to choose from. Our bed was extremely comfortable,and our room was quite cozy. Kenny was more then happy to help us with any questions we had about the area. Easy walk to downtown restaurants and bars. Nice landlord receiving us. Breakfast fine. Landlord was very friendly and helpful breakfast was lovely and liked the Scottish attire nice touch. would stay here again. Good location easy walk to town. Silverstrands was a cosy, clean and comfortable guesthouse, within walking distance from the city centre. The service was excellent. Not only was it friendly, but Kenny very kindly arranged to send on something I had left there! I would recommend it to others. Worth making reservations for dinner on Fridays and Saturdays, if you want to eat at any of the nicer restaurants - they book out! Local shops and restaurants are walking distance. We enjoyed a few meals in a restaurant which is literally a block away. We also recommend walking to the Victoria Market which is very quaint. Clava cairns are also an interesting place to visit. Very clean and comfortable. The best breakfast we have had so far. It is in a great position can walk for a meal at night. Très bonne adresse, tout était parfait! Gentillesse, propreté, accueil, petit-déjeuner, parking devant la maison, calme et à quelques minutes du centre à pied. It's not that far from city center, so do not hesitate. The staff are super friendly, staying here was like coming home, even if only for a night. We found Silverstrands all that we hoped it would be. Kenny was very pleasant and helpful. Our stay at Silverstrands was the icing on the cake for our weekend. We will be back. We stayed at the Silverstrands for one night and it was really great. The owner Kenny is very friendly and helpful, the room was very comfortable, and the breakfast was delicious! Good WiFi, closely located to downtown Inverness, Free parking outside. We can warmly recommend a stay at Silverstrands. Great host, directions, and breakfast. Very walkable to all locations from here. Would both recommend and stay again. We did tours that left from the bus station. All were good we used wow Scotland. On the way to town is a restaurant little Italy which was good and we liked the kitchen. Thought the food at cafe one was over cooked. Proprietor extremely friendly and accommodating. A perfect host. The staff was wonderful, the breakfast delicious, and the location was great for walking to the downtown area! Loved it here. We drove out to Gordon Castle for some Highland Games about 30 min away, and they were fantastic. Also did several distillery tours nearby, Glenfiddich was about an hour, but it was by far our favorite. The town had a great little evening nightlife scene, we walked around and followed the noise to wherever seemed like it was going to be a good time. Tried out Hootenany at the recommendation of the owner, and enjoyed the music and dancing on our first night in town, then went upstairs for some more modern nightlife. Everything was a delight during our stay. The Staff are very hospitality, I forgot my rain coat in the room, he kindly send it to the hotel i shall stay in London. The warm welcome, the very comfortable bedroom and the fabulous delicious meal are very attractive. We love it so much. The rooms are clean, tidy and quite. Bathroom is quite small, although it has everything you need. The breakfast was great and staff was very friendly. A really lovely b&b. A friendly welcome, well managed and maintained. Will definitely book again. Very good value for money. Friendly pleasant service. Would be great to have laundry facilities as people on holiday need to keep washing up to date. Even having towel rail warm for longer would make it easier to dry smalls. I stayed at the Silverstrands for one night and it was great. Kenny is very friendly and helpful, the room was lovely and comfortable, and his food (or his wife's, rather) was delicious! I loved that he was in full Scottish dress for breakfast service. I'd definitely stay here again! Small bathroom in my room but it works, good WiFi, and nice and close to downtown Inverness while still being out of the way of the hustle and bustle. Free parking outside. The TV was not that easy to use with 2 buttons. Comfortable bed but a bit too hot even with window open. Kenny was a great host. If we are ever back in the area, we'll stay here again. His wife makes a scrumpous breakfast, esp the black pudding with wonderful spices throughout. Great breakfast! Comfy bed. We enjoyed our stay. Nice little rooms with all you need, good beds, silent location, very good breakfast and very friendly owner. Good place to stay in Inverness. Great hosts. Very friendly and helpful. Breakfasts were fantastic. Room was quiet and restful. Definitely would recommend Silverstrands. Nice place with god service. Superb, homely, very welcoming Guest House. The landlord Kenny was very accommodating and helpful. Cute countryside cottage with friendly and helpful staff. Good location for early ferry to Skye island. Very friendly proprietor. Gave us a very warm welcome - much appreciated. Breakfast was excellent, though the tables are slightly small considering the offering. Very nice views from Inverness Castle. Inverness Crazy Golf is great fun: highlight of my holiday! Silvlerstands was just what we wanted. Quiet location but yet only less than 10 minutes walk into the city centre. Kenny was the perfect host being very helpful and kind. Will definitely stay again. Never been served breakfast before from a man in a kilt! Nice staff and very early morning for breakfast because of ETAPE Loch Ness. We were extremely well received by Kenny. Always has a smile and time to listen! The room was perfect and so was the breakfast! Best experience in our 11 day tour of Scotland. Kenny suggested Hooten nannies for dinner...you have to go there just for the musical entertainment! Lovely place, good location, great food and very friendly and helpful staff!!! Clean quiet and well run B&B with excellent breakfast! Thanks Kenny! Great host fantastic breakfast great selection very clean lovely bed. The accommodations were amazing. So clean and lovely. You could easily walk to shops and restaurants. Kenny was so accommodating when our friend decided she needed her own room. We really appreciated everything that was done for us...and the breakfasts were outstanding! Great experience in all respects. Kenny has a great character, and he was a marvellous host. Weather permitting, hiring a bike and cycling to Loch Ness/Dores Inn was a very nice experience. A smaler nice place, with good service and staff. Great host, location, food and décor. You can't ask for more. Very welcoming, nice room, amazing breakfast, and a great host. Perfect B&B. Clean, hospitable, spacious. Castle Tavern was very nice for dinner. Enjoyed a very good dinner at the Fig and Thistle. The Gellions pub across from the information centre was a great spot for a beer/whisky and some lively Scottish music. Culloden Battlefield and Visitor Centre was well done and very moving. Terrific place to stay! Great location, well outfitted, friendly, helpful owners, meticulously clean! We would certainly stay here again and would recommend it to others. Wonderful und friendly place to stay, easy access to the city, Kenny ist a great host and we love to come back here. Thanks again, we had a great time. We discovered a very nice restaurant in Dingwall, a few miles from Inverness. Absolutly great scottish food, best we had on our trip, the early bird menu for 14£ and ist was absolutely amazing. They have a very good selection of glutenfree food. The staff is very friendly and attentivly. The restaurant is on High Street, its "the Victoria". very nice place to stay, you'll be given choices for breakfast in advance, the host is nice too, we arrived earlier than normal check in time, he let us check in and helped to carry lugguages. room is tiny but comfy, generally it's recommended. Easy to find. Walking distance to town centre, dining and sites. Parking out front. Building was very clean and tidy. We shared a bathroom but it was not an issue. Host and Hostess were fabulous. Breakfast was great! Great little place. Nice walk to town. Kenny was incredibly welcoming. Wish we had an extra day to spend here. One night wasn't enough. Breakfast was quite the spread. Thank you so much! Awesome place, close to everything and nice parking. Great location on a quiet street. Only a short walk to the city center. Kenny was friendly and helpful. I had booked a room with a shared bath, however, I was offered an available room with ensuite bath at no extra cost. I greatly appreciated that gesture. Excellent breakfast. I definitely would recommend the Silverstrands Guest House. The room was very nice with pretty decorations. Everything was clean and prepared for our arrival. The hosts were very friendly and helpful. Big breakfast and it was absolutely delicious. We enjoyed our stay very much and would recommend it! Tour with Jacobite to the Loch Ness by bus and boat. Visiting the Urquhart Castle. Walking along the river Ness is very beautiful too. Silverstrands is awesome! It is spotlessly clean, has very comfortable bed, and is located on a quiet residential street just a few minutes' walk from the city center. Dorothy and Kenny are great hosts and cook a very fortifying breakfast, in addition to providing great tips and tidbits about Inverness, Scotland, and life in general. Would definitely recommend Silverstrands and would definitely stay again. For a quick and inexpensive dinner, try the cafe at Morrison's grocery store. While we only had one night at Silverstrands Guest House, we had a fantastic experience. Kenny was the most gracious of hosts. The room was cozy and very comfy. Even though it was quite small, we never felt crowded. Breakfast was incredible and the offers on the menu were excellent. Overall, this was a fantastic stay and if I ever find myself up in that part of Scotland again I would definitely stay here! Very clean, organized, and dependable. Excellent breakfast. Lovely place to stay, our room was great spotlessly clean lovely fluffy towels and a fantastic breakfast Kenny is a great host really looks after his guests would stay again if ever we were in Inverness. Silverstrands is in a great location close to all amenities were it is situated is so quiet and peaceful with just a short walk to town and great restaurants. You have a very clean and comfortable guesthouse, and we really enjoyed our stay with you. Thank you for your good humour, hospitality and good humour! Very nice place in a very nice location.. couldn't say enough about the owner, very very nice gentleman. Loved this B&B. The place is immaculate and very welcoming. Every little detail has been thought of and you could nit want for anything. Kenny was extremely helpful. Very clean and comfortable accommodation. 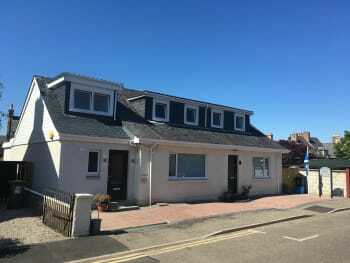 Extremely well priced and great location,can easily walk into Inverness. Good choices for breakfast and beautifully cooked. Host and hostess very friendly and helpful. Fantastic variety of restaurants and such a lovely city to walk around. The owners were friendly and helpful. The food was excellent. The bed and breakfast was a convenient location for walking into town to local restaurants. This was the perfect taste of Scotland. All rooms are fairly small, but have everything you need for a few nights stay. The staff is wonderful! Breakfast was delicious! Ask for room 3. We had sliding glass doors into a lovely little garden. Perfect place to stay very friendly and helpful ,first rate breakfast was very tasty and plentiful, room and bed was really comfortable,bathroom was very practical for a disabled ambulance person and beautiful as well. we would like to come back again .made our anniversary visit to Inverness, thank you. We found the highland hotel lovely for dinner and afternoon tea also also we had great bowl of soup both day at cafe in east gate centre. There was plenty to do boat cruises and dolphin and wildlife spotting and of course shopping borrowed a shopmobility scooter which helped a lot also very helpful station staff . Good impression of Inverness will be back. Kenny was extremely welcoming when we arrived. He helped us carry our bags up to our room, which was clean and spacious, with a great bathroom. The beds were comfortable. The room was set up to have tea, water, and ginger cookies (although we would've loved if they gave us more after the first day!). We were given a menu to fill out for breakfast and the breakfast was amazing! I had the full Scottish breakfast and everything was delicious. There was also lots of fruit, cereals, toast, etc out in the dining room to add. Only about a 10-15 min walk to the center of town. We felt really comfortable and at home there and Kenny provided lots of info about the area and anything we needed to know for our trip. I would definitely stay there again and very glad we had three nights there. Maybe the best B&B that I've stayed in! Kenny did a great job of explaining some great places to eat and go for music. Visiting Culloden Battlefield and Clava Cairns with public transport is easy from the center of town. We did a day trip to Skye with Wow Scotland Tours, which was great and I would highly recommend. We couldn't have been looked after better. Fantastic host and hostess!! There are a myriad of things to do but if you want a total Scottish experience then go to one of the Scottish Games. We would recommend Tain and Strathpeffer. It was very clean and the owner was very welcoming. Breakfast was very good and plenty of choices. Within walking distance of town. Near town. Can walk by the Caledonian canal to get the boat for Loch Ness. About 1.30 hours walk. Perfekte Unterkunft mit einem sehr gastfreundlichen Vermieter. Silverstrands is an excellent place to stay! It is just a short walk to city centre and far enough away to provide ample parking and a quiet location. 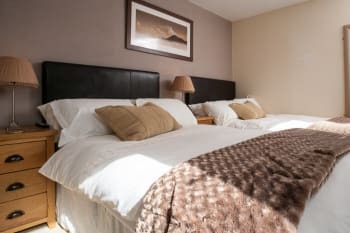 The rooms were very comfortable with a couple of lovely touches such as an in room fridge and bottled water provided. Kenny was so helpful orienting us to the sights as well as restaurants. Breakfasts were well prepared and very prompt! I would highly recommend Silver Strands. Don't miss doing a nice river walk down to the Ness Islands, crossing over through the islands and returning on the other side. It's a beautiful walk, rain or shine! We were very happy with our bedroom. It was very spacious, as well as the private toilet. The matress was extremely comfortable and everything was very clean. The owner was very kind and breakfast eas delicious. I totally recommend it . The room and the toilet are very clean and there's free parking outside the guest house. The scottish breakfast provided is excellent and I will recommend for tourist to stay in Silverstrands Guest House. La estancia en Silvertrands Guest House ha sido estupenda. Kenny es un anfitrióna genial, atento en todo momento. Nos dio unas interesantes indicaciones para visitar Inverness y cenar. El Guest House está a 10 minutos andando del centro de Inverness. El desayuno genial, abundante y muy rico. ¡¡¡Y servido por Kenny vestido con su Kilt!!! Recomiendo la estancia sin ninguna duda. A fun place to stay and very close to the centre of Inverness. Great breakfasts served "by the man in a kilt" - Kenny is a great host. The place is very clean and comfortable and up to date with its amenities. We did the Culloden exhibition which was wonderful. Had a great time at Bunchrew House. Had a couple of meals at the local pub nearby - The Heatmount - which were excellent. Kenny was very warm and helpful. He gave us very good advice for having dinner and for listening quality folk music -which we enjoyed a lot. The cleaning is impeccable, as well as everything else. The breakfast was delicious. Would come back anytime. Very friendly. Comfortable stay very close to centre. Perfect for our 2 night stay. Warm welcome, quiet Cul-de-sac location within walking distance of the city. Great decor and cleanliness throughout; nicely cooked breakfast and the kilt a nice touch! Would definitely stay here again if we revisit inverness. Very beautiful and friendly B&B hotel. Breakfast was excellent only Bathroom is a little bit small but perfectly clean. Very friendly host, gives good advices. Would totally recommend ! The Castle Tavern (10 min walk) is great, especially if you need to eat a bit late. The room was very clean and the host was very sweet. Perfect breakfast! Kenny was really nice and helpful host and we enjoyed our brief stay. Kenny, you were so help fans accommodating, you really were a large part of the enjoyment of our stay. The room was lovely-nicely decorated, comfy, and clean. We appreciated that we had drawers and the closet as well as the side tables with drawers . Breakfast was delicious! We went to the Italian restaurant down the pedestrian walkway towards the shopping center/don't know the name-and really liked it. We went on the Wow Tour-great-and we to the Highland Games which were really fun. Just Excellent! The house is spotless. Kenny gave us a warm welcome and was attentive. 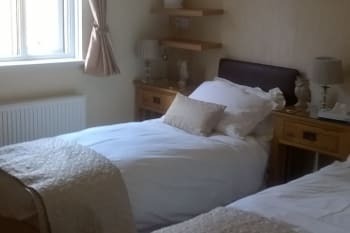 Very well working B&B, not too far from city centre. This was a nice house that's been transformed. It's in a residential area so be sure you know where your headed. The walk into town is nice and not too long. It's close to many places to shop and eat. There is a nice little spot out in the backyard to sit and enjoy the weather (if it's nice). The rooms are comfortable and well appointed. Breakfast was wonderful and home cooked. It was also customizable which was wonderful. Just walk around town, rain or shine it's a beautiful place to be. There are lots of places to eat down by the river. You can see the cathedral and castle on the hill. Be sure that you take a bit of a drive into the highlands near by. They are breath taking. Welcoming host. Nice and clean room! Great location. Really great! It was an absolute pleasure. Incredible service, very accommodating, very friendly. The house was like a little dream, simple but very warm and cozy. Kenny was very friendly,the room was very comfortable and breakfast was great. Lovely stay, Kenny was very friendly and helpful. Best B&B we have stayed at during our two weeks in Scotland. Extremely friendly host, let us check in early. Breakfast was delicious. Room and bathroom were comfy and clean. We had room 3 with access to the backyard/patio, was lovely. Great stay, and the host Kenny was endlessly entertaining, and very knowledgable. Wonderful host, excellent breakfast and an easy walk into the city center. Easy parking on the street was also a plus. Just ask Kenny, he was very helpful and knowledgable! Very welcoming and helpful host! Great location to get everywhere. Wonderful experience, loved the guest house and Inverness. Kenny was an amazing host, wore his kilt every morning for breakfast! Definitely go to the Culloden Battlefield for an amazing experience. Loved Castle Tavern for friendly crowd and food. La Tortilla was a pretty great and very reasonably priced surprise tapas place in town. All in easy walking distance from Silverstands Guest house. The location is great for walking to the center of town. We had our own car so this was not an issue for us. The location is at the end of a dead end street in a very quiet neighborhood and their is ample free parking. The owner is extremely friendly and accommodating. Room is nicely furnished with nice amenities. A great Scottish breakfast is served in the morning by the owner dressed in his Scottish kilt. Very enjoyable stay. Very clean, modern furnishings and bathroom, wonderful breakfast! Short walk into city centre, close to castle, river, restaurants etc! Nice friendly welcome. very central and in walking distance from shopping area and public transport. Perfect home base for our trip out to Skye. Hosts were incredibly friendly and accommodating, especially with our early morning trips. The room at Silverstrands Guest House was beautifully decorated. The ensuite had a bath which was lovely after travelling. There was a fridge in room which we found hard to find in the UK a big tick from us. Everything was spotless. Our breakfast was yummy & plentiful. Our hosts were very friendly. We definitely would recommend to anyone. We ate a lovely pub meal at Corriegarth Hotel which is two minutes walking distance. Clientel & staff very nice. The room was well equipped for all our needs (drinks and toiletries). Very cosy, nice and clean! You were a perfect host! very kind, accomodating and welcoming. You gave us good tips for the city. Very good breakfast! The only way I would improve the service would be to offer a gluten free option with bread or cereals. And maybe more options with the salmon breakfast (eg. Bacon or tomatoes). Or maybe offer an extra slice of salmon. :) Our stay with you was very enjoyable and we would definitely recommend it!! Thank you!! Very good hot chocolate at So Coco. And good restaurant with gluten free options in the menu at Girvans restaurant! Great place with a very friendly owner! Helpful friendly staff. In a quiet area of town within easy walking distance of town. Number 27 has fabulous food and service. Local walks along the river are beautiful. Kenny was most welcoming. A nice touch to our stay was Kenny presiding over breakfast in a kilt. The room and breakfast were of an excellent standard. We only stayed in Inverness long enough to enjoy a brief look around the city centre. Kenny met us at the front door with a smile. He was very helpful regarding local restaurants and directions. A great host! And his wife is quite a cook! Walking distance to downtown for restaurants. Home is on a dead-end street with plenty of parking and quiet. We ate at McGonagall's, a local steakhouse. Get there early or make reservations. The place is very clean. Our bathroom was a bit small but no problem for a short stay. Extraordinary cleanliness and wonderful breakfast! This was an absolutely wonderful place to stay. Everything was perfect. We could not have asked for anything more. Exemplary service . Very comfortable . Delicious breakfast . Grade 10. We felt very comfortable and will definitely stay here again. there is a fantastic pub/diner situated in view of the castle............must look for it, the food and ale are out of this world. Best B&B we have stayed at. Hospitality is amazing. Rooms are fairly sound proof. Nice touches throughout. I had a great stay and the room had everything I needed, the shower was lovely and powerful and bed really comfy. The full Scottish outfit for breakfast service is a great touch. If I come up to Inverness again I wouldn't hesitate to book here. Easy to find and quick and easy to walk to the river or into the city centre. Very clean and well presented. Very helpful and good breakfast. Really helpful and friendly hosts. Clean't and classy! Inverness a friendly city with a great nightlife. City centre close with plenty of things to do. The room we had, was lovely. A comfortable bed and some attractive touches. Breakfast was good. Kenny, our host, was friendly and informative. Couldn't really find fault with anything. Excellent. It is a short 10 minute walk into town, where there are plenty of shops and places to eat and drink. We went to Loch Ness - a 20 minute drive. One of the nicest guesthouses I have visited. Perfect service with a smile! Welcoming, comfortable and very pleasant! Hope to stay again sometime. Many thanks. Not too far to walk to the centre of Inverness and all the restaurants, cafes etc. Kenny the owner, very frienly person, you feel like in your house.beautfull roon with all you need.the breackfast is Exellent. Perfect place !! Great place to stay excellent breakfast. Great welcome. Really appreciated the helpfulness and conversation with our host! Great sticky toffee pudding at the Castle Tavern and music at The Gillian (?spelling?). We really enjoyed the Fig and Thistle for dinner and Velocity for afternoon tea and cake. Spacious room, very clean and beautiful. Delicious breakfast with many options! Free park using the owner's permit license was a plus. Very friendly staff! Thank you! Silverstrands is a 10 minute walk from city centre. We had an excellent dinner at Mustard Seed on the river. Reservations are necessary. Great location! Fantastic breakfast served by a man in a kilt! We enjoyed our stay here immensely. There is lots to do around Inverness. If you can, drive out to one or two of the nearby distilleries. We went to The Macallam - it was impressive and delicious! Silverstrands was super close to the heart of Inverness and we easily found great restaurant choices. Wish we had planned for more time in Inverness and would happily have stayed 2 or 3 nights here. We didn't spend much time in Inverness. Just an overnight so can't comment on much. We just needed a place to rest our heads for the night and we're glad we booked at Silverstrands for that single evening. Thank you for being so warm & welcoming. Your hospitality made our stay there wonderful. I will definitely stay there again in the future. You guys do it right. Best B&B for our week tour around Scotland, nice decoration, spotless clean, fantastic breakfast and very friendly landlord!! Everything ok. Very good welcome. Very beautiful room. Excellent breakfast. Only put a flexible tuving in the shower. This was by far my favorite place we stayed during our 9-day vacation in Scotland. The house and garden are charming. The rooms were lovely and clean, and the bed was even more comfortable than my bed at home(and much more comfortable than any other place we stayed during our trip). Breakfast was delicious, and our host was friendly, helpful, funny, and gracious. I wish we could have stayed longer, and will definitely stay there again if I'm back in Inverness! Silverstrands Guest House is walking distance to shops and restaurants, and the lovely river. Our host recommended several restaurants, and gave us a map to help us get around. We followed his recommendation for dinner, and I'm glad we did - Hootenanny had friendly staff, good food, and lovely eclectic décor. Inverness is beautiful, charming, and walkable, and I loved staying at Silverstrands Guest House! Affectionately decorated room with private bathroom. Only a short walk to city center. Cordial and friendly hosts. Opulent breakfast. Good Wifi. Very comfortable rooms, nice decoration, excellent breakfast and attention from the owner. The hospitality provided by the owner was great and the breakfast was excellent. Had a great visit. Ken was very welcoming and helpful, the room was clean and nice, and the location was very convenient. Definitely go to Hootanany's to hear the local Scottish musicians and drive over to the Culloden battleground. 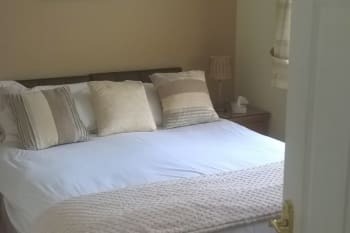 This guest house is situated only a ten minute walk to town centre,the rooms are spotless. The owners are really welcoming and friendly. The cooked breakfast was excellent. Would definitely recommend . Very nice B&B Guesthouse. The Breakfast was very good. Great location 10 minute walk to downtown. Rooms clean. Parking available. Host is friendly and knowledgeable of immediate areas and other regions of Scotland. We would rebook if back in Inverness. Breakfast lots of options. Only 8min walk to Main Street; and excellent bistro food 1 min walk away. Loch Ness only 25min drive. Cull oxen Battlefield in other direction; also not far away. Wonderful hospitality. Beautifully decorated room. We had a very enjoyable stay. Room was big and comfortable. Breakfast was a tasty way to start the day. Great selection. Kenny was a very friendly accommodating host. Lots of advice. Silverstrands is very close to the high street and river ness. Go on long walks on both sides of the river then off to any of the pubs for very tasty food and beers. Try the local brews. It was a really pleasent stay. We enjoyed it. We had a very good stay at the Guest House. Kenny was a real Scotsmann and his breakfast was excellent. It was quiet dring the night and we left the house with good feelings on the next morning. Kenny, the Host, is a very warm person. He takes care to the finest details. The property has a personal touch. Its safe and clean. Recommended to other travellers. Breakfast is a delight. My best wishes. Walk by the River Ness. On Tuesdays, the Royal Band plays the Bagpipes in the market square adjacent the Castle. Is a must watch. Nice lodging, quiet neighborhood, easy walk downtown. Kenny was friendly, cheerful and helpful. highly recommend spending time here. Walk downtown, it's easy and you can see the lovely homes of Inverness. We actually loved that the B&B was not in the heart of the downtown area. Our family enjoyed our weekend stay and Kenny was wonderful when we came to him for help for directions and help at his house. Delightful. Very friendly host, quiet location. We thoroughly enjoyed our stay here. The room was spacious enough for two adults, even with large luggage. The breakfasts were excellent. Kenny was friendly and accommodating. He always made us feel at home. Getting to city center was a short walk from location. And there were plenty of food options. Access to main roads for day trips was easy. The Castle Tavern was nice and cozy. Good food. Also, Johnny Foxes was a fantastic restaurant and pub. Walking the river gives beautiful views and great architecture. Thank you very much for your hospitality. We enjoyed our trip very much thanks to your taste of the hotel management. Our expectations were high, thanks to the good reviews of others, but Silverstrands was even better! Kenny and his wife are terrific hosts. The room was first-rate, especially considering the very reasonable rates. Breakfast was also excellent. It's in a quiet, very pleasant residential neighborhood that is a short walk from the center of town, and about a twenty-minute walk from the Eden Court complex. We found ourselves at the Eden Court three nights in a row for a movie, a play and a great youth concert with pipes and drums. Check its busy schedule. Also, take the walk along the Ness toward the beautiful islands. A local bus will get you to the quiet, Eastern shore of Loch Ness and a gorgeous trail to the water. We loved Inverness. Lovely place to stay in Inverness, very homely, cozy and comfortable. Walking distance to City centre, just 10 min. And still so quiet. Me and my husband loved our 2nights stay and would love to come back again. River ness, castle near ness bridge, Victoria market are some places to see. We loved Inverness for its natural beauty and drove around the area to experience countryside. Delightful time in Silverstrands guest house It was a very nice, warm and kind place to stay. The manager was very friendly and kind he even made me breakfast to go the day I left I felt very taking care of, like I was in home. We love how he was dressed every morning. Breakfast amazingly good. Nice and quiet rooms. And tee and coffee to make with cookies in our room was a very nice touch with the cold weather that we had. We had such a lovely time in Inverness and the service we received from Silverstrands made our trip so much easier. It's extremely easy to get to the main center and is so quiet during the night time. The breakfast was impeccable. We really appreciated the calm of staying here. We traveled for 2 weeks staying many places and Silverstrands was the most clean and had the most comfortable bed too. We went to visit Culloden & Urquhart castle which isn't far at all. We had a car rental but these are easily accessible by bus too. We loved our two night stay at Siverstrands! Kenny was extremely friendly & accommodating & happy to help on all levels! We needed an earlier breakfast time on check out as well as a cab called & a place to store food perishables overnight - all of these requests were met by him with ease! 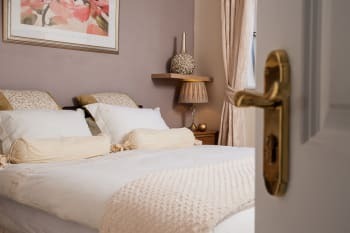 Our room with ensuite bath was beautifully appointed & immaculate & the breakfasts fantastic in their well stocked dining room! A great stay overall! Inverness is a wonderful little city. Make at least a half day for a trip to Culloden - worth every moment. Kenny's suggestion of the Castle Tavern for a meal/pints was spot on; be sure to go! We had a wonderful stay at this perfect guesthouse. Kenny is a great host and served us excellent Scottish breakfasts. Our room was more on the small side but had everything we needed. Inverness has a couple of good restaurants. We especially liked Cafe 1, and the restaurant at the Heathmount Hotel just around the corner of the B&B was also a good choice with friendly staff and reasonable prices. We felt very welcome and almost like home. Kenny and Dorothy were great hosts. Every room has its own charme and is decorated in a harmonious manner to the smallest detail. We enjoyed our stay a lot and can highly recommend this B&B. Lovely accommodation and great hosts. The room was spotless. The food was excellent with lots of choice. It was a nice touch being served by Kenny in traditional Scottish dress. We would definitely choose to stay there again on our next visit. It was certainly 5 star accommodation to us. We will certainly be recommending Silverstrands in Inverness on Trip Advisor. Day tour to Skye. Day tour to Loch Ness taking in Urquhart Castle. Lovely walk by the river Ness. We also checked out Eden Court Theatre (by the river) for live entertainment. Corriegarth (local to Silverstrands), excellent food. Kenny and Dorothy could not have been more helpful, especially when my car broke down. Great place for a woman staying on her own - safe, comfortable, quiet and welcoming. Easy to find. Close to city, can walk in. Jimmy Chungs do a very good Buffet. Loch Ness and Urquhart castle. Nica wheather in April. Nice small city, good food etc. Inverness is such a quaint city. Just a 10 minute walk. We really enjoyed our stay. Great breakfast, comfortable bed, excellent facilities - no complaints whatsoever. First class! We had a very warm welcome and our room was really lovely and luxurious. Our breakfast was to die for (having the Scottish breakfast). Just a short walk to Inverness shops and the River Ness. everything is good, especially the delicious breakfast.